Social Sciences –Open Access Journal – Social Sciences (ISSN 2076-0760) is an international, open access journal with rapid peer-review, which publishes works from a wide range of fields, including anthropology, economics, law, linguistics, education, geography, history, political science, psychology and sociology. Social Sciences is published quarterly online by MDPI. 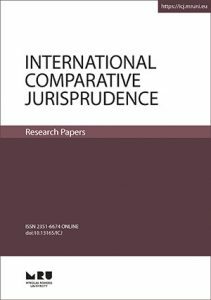 International Comparative Jurisprudence (ICJ) hosted by Elsevier. EMAJ – Emerging Markets Journal is a peer-reviewed semiannually published international Business Management Journal. The aim of EMAJ Emerging Markets Journal is to publish high-quality articles about the latest developments in the field of Business Management. The journal focuses specifically on emerging and developing markets and with particular importance to management challenges arising in relation to the ongoing changes in those markets. The journal welcomes contributions with both local and global perspective on management processes and challenges arising in this new environment. Studies with a single-country as well as multi-country focus are welcome, and the journal is also open to a multitude of methodologies and research designs.